Fortunately I recently returned home to a 10 pound bag of carrots in my refrigerator, the result of a”of course I want to split twenty pounds of carrots from your CSA!” conversation with a friend. 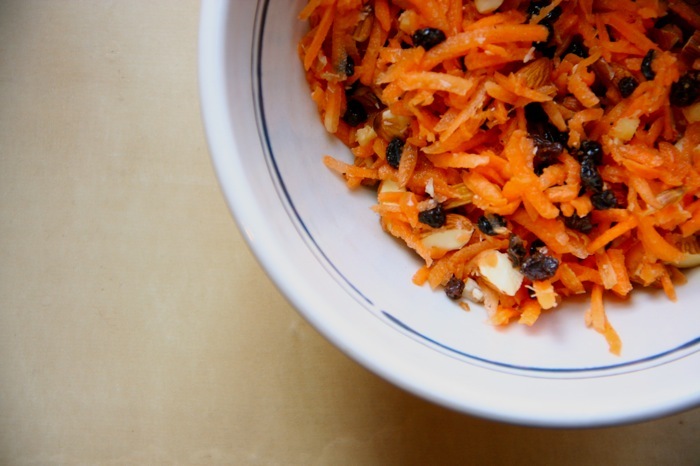 (Just think of the carrot cardamom marmelade I am thinking of making…) Said friend made a carrot delivery while I was out of town and hence the creation of a winter salad that’s both sweet and gingery and colorful enough to brighten a gray day. In a large bowl combine all salad ingredients. Add dressing and mix until until well blended. Amuse-Bouche: Which Kind of Salt Would You Prefer?